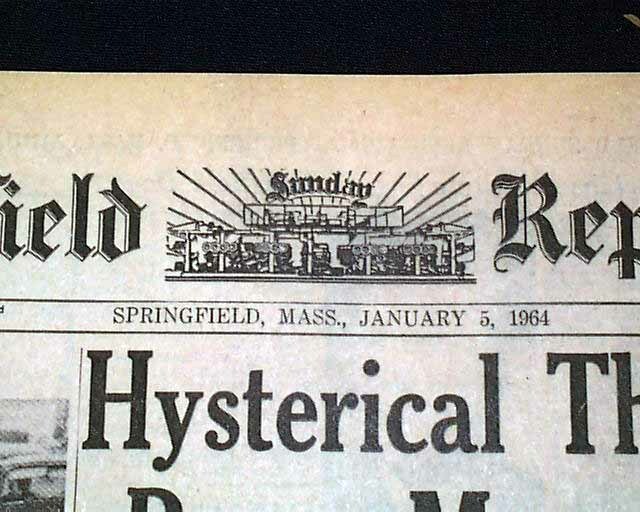 SPRINGFIELD REPUBLICAN, Massachusetts, January 5, 1964. 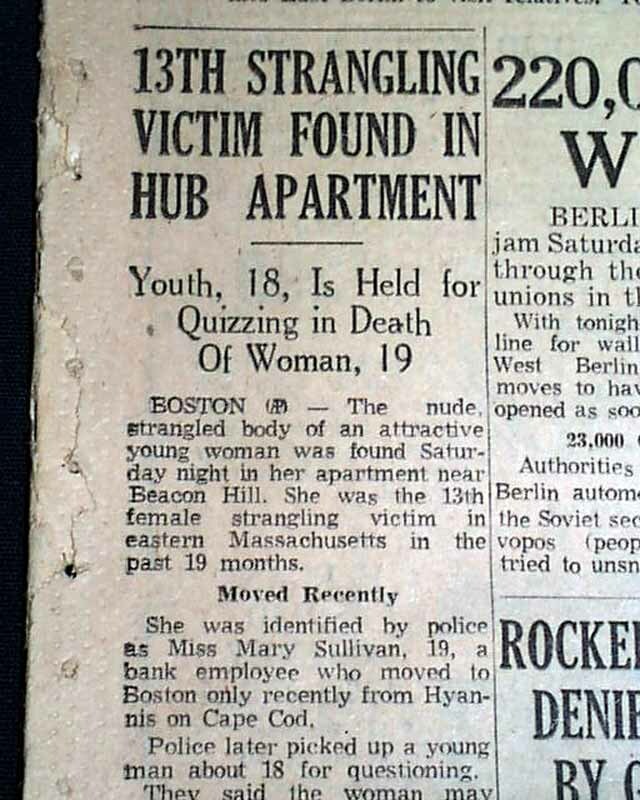 This 50+ page newspaper has a three line, one column headline on the front page: "13TH STRANGLING VICTIM FOUND IN HUB APARTMENT" with subhead: "Youth, 18, Is Held for Quizzing in Death of Woman, 19" which tells of the last victim, Mary Sullivan, the Boston Strangler murdered. Hard to say if this was reported nationwide as this is from a city close to Boston. Other news of the day throughout. Historical Background: In November of 1943 at age twelve, DeSalvo was arrested for assault, battery and robbery. In December of the same year he was sent to the Lyman School for Boys. On October 1944, he was paroled and started work as a delivery boy. In August 1946, he returned to the Lyman School for stealing an automobile. After completing his second sentence, DeSalvo joined the U.S. Armed forces upon his parole. He was honorably discharged after his first tour of duty. He reenlisted and, in spite of being tried in a Court-martial, DeSalvo was honorably discharged. 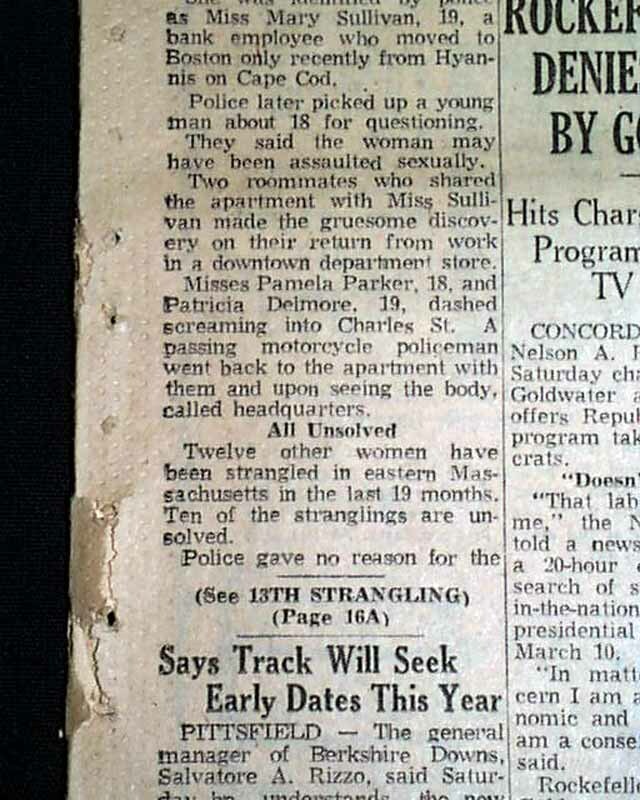 Between June 14, 1962, and January 4, 1964, thirteen single women (between the ages of 19 and 85) were murdered in the Boston area. All thirteen women were sexually assaulted in their apartments, then strangled with articles of clothing. Without any sign of forced entry into their dwellings, the women were assumed to either know their assailant or voluntarily allowed him into their homes.